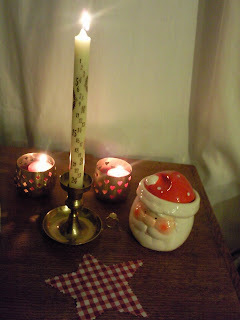 Here is a little corner in my flat with some Christmas cheer! Its not much but it is my favourite Christmas corner at the moment. 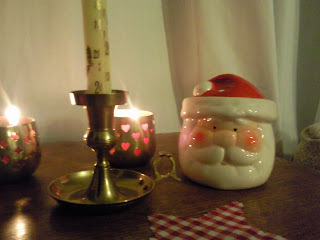 The little Father Christmas jar came from a 99p store and the brass candlestick holders were all charity shop finds! Whats your favourite Christmas corner? Love your father christmas..my favourite corner this year is the landing, done in teal, fuschia,lime green and purple...very modern for me but looks very bright and cheerful. The other thing I like is that I put my cards as they arrive in appropiate places..eg this year have had sveral snowmen and they all go together by my china snowmen, the religious ones go near my nativity set etc...makes me look at the cards more and they really add to the decorative effect...I know, I know, I'm sad !!!! !